€26.60 incl postage in Ireland. 2. The Pipe on the Hob/Scully Casey's (Jigs) 2:113. 4. Lamest for Willie Clancy © (Song) 2:585. 6. Farewell to Miltown Malbay © / Mother's Delight (Reels) 2:127. 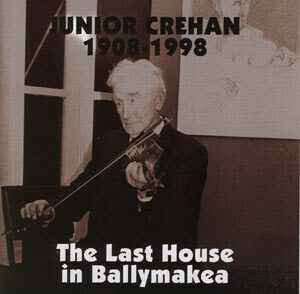 This compact disc has been compiled as a tribute to Junior Crehan (1908-1998). It gives a complete picture of the man, the musician, storyteller, singer and composer. Best known to us, his children, he was a unique figure in that he embodied a direct link with the past and remained a symbol of the continuity of tradition down the years. Because of what he passed on, it is very important to have this continuity unbroken. A compilation of his work has not been previously in the public domain. Therefore, it is a very valuable contribution to the treasury of traditional arts. This work has been compiled from many recordings of his music, storytelling, song and tune compositions from the 1950's onwards. The CD gives people the opportunity to hear fiddle music in the true, pure West Clare traditional style and it identifies the impact he has made in the world of Irish Traditional Culture. Included in the collection is a recording of a song from Junior's wife Cissie, (born 1910 and thankfully still with us), recorded in 1958, and a recording of Junior's mother, affectionately known as 'Baby' (1876-1968), playing concertina at 87 years of age. These are true examples of a tradition being handed down.